Coco on 8 is a new launch at Media One Hotel, offering a cool and laid-back atmosphere in chic, Miami-inspired surroundings. Occupying the space that was once Dek on 8, the venue has undergone a trendy makeover, and is now open for guests from lunch through to the evening, when the party gets going. The spacious pool and bar area is an ideal spot to chill during the day next to the pool, while enjoying a bite to eat and refreshing cocktails, or straight from the office for post-work drinks and an early dinner. As the evening goes on, the atmosphere comes alive with DJs that get the party started. The menu here is perfectly designed to keep things light and practical for sharing around the pool. From crudos and sushi, to wraps, salads, flatbreads and small plates, plus those to share – not forgetting dessert – there’s something for everyone. Expect dishes like tuna poke with avocado, California maki rolls, a dozen freshly shucked oysters, and succulent mini skewers of beef, chicken and halloumi to share. For something a little heartier, the Coco club wrap with chicken, cheese and eggs is satisfying and scrumptious. If you fancy something sweet to conclude, chocolate dipped strawberries or salted caramel and milk chocolate rice rolls are sure to take your fancy. The staff at Coco are fun, energetic and helpful. An ideal place to visit for a relaxing day by the pool with light bites, and your girlfriends – or alternatively, turn it into a night out and head for sundowners and enjoy the evening ahead. Details: If visiting Coco on 8 during the day, it’s AED 75 for a day pass, which fully redeemable on F&B. 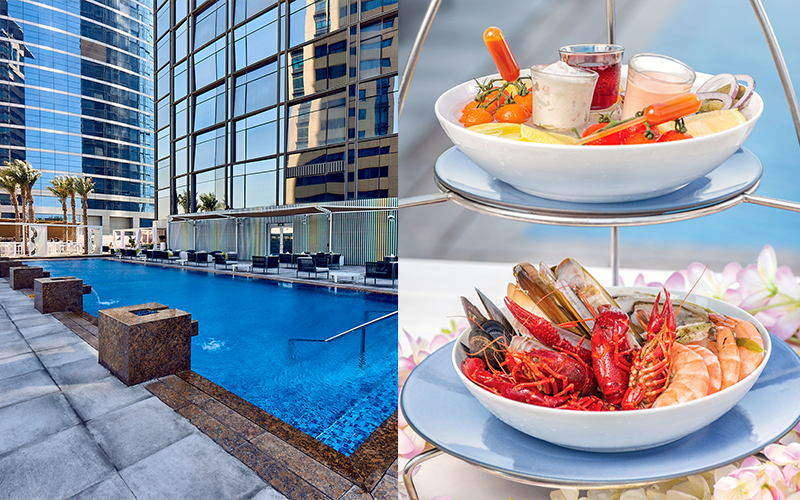 Don’t miss Happy Hour daily from 5pm – 8pm, with drinks and small plates from AED 30. For more information, visit Media One Hotel.